From page one this book dives, unapologetic and unafraid, into an incredibly controversial topic. And, for the most part, it does so effectively. The book opens with our protagonist, Genesis, walking out of the procedure room post-abortion only to find that her boyfriend, who had accompanied her, has left her stranded. As the book progresses, we see Gen trying to come to terms with what’s happened, what it means and how experiences from her past shaped who she is now and who she will become. With a fast-paced plot and a compelling premise, this book was difficult to put down. So difficult, in fact, that I finished it in two sittings. As I moved through the book, I developed a legitimate investment in Genesis. I felt for her and I wanted the best for her. To me, any book that can garner this authentic emotional connection is a worthwhile read. I wanted to see more so I could better understand his motivation. I don’t really ascribe to the idea that Gen is 100% right and her ex 100% wrong. There was more to see, but it wasn’t shown. This left me frustrated. Really, she failed to develop any of the characters, save Genesis, in any meaningful way. Her friend, her mom, her cousin – all got cursory introductions and minimal backstory. While it’s understandable that Pipkin may not have wanted to dedicate copious amounts of time to these secondary characters – as doing so would detract from the main point of the book – this lack of development made these characters appear a bit too flat and hampered their believability. Pipkin does use flashback effectively throughout, adding some depth to the character and enabling her readers to better empathize with this young, lost teen. If anything, I wish she had used the technique a bit more heavily as a tool to develop these secondary characters. Ultimately, Aftercare Instructions was a successful exploration of this complex topic. It reminded me of Amy Efaw’s After with its grit and largely uncensored exploration of the physical and emotional ramifications of an unintended pregnancy. In the tradition of Angela Johnson’s The First Part Last it provides a cautionary reminder of how serious the consequences for unprotected adolescent exploration can be. 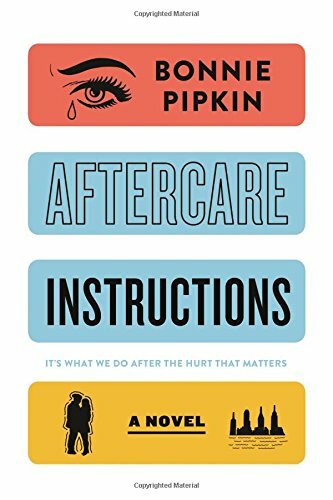 A compelling read that I would definitely recommend, I give Aftercare Instruction 4 out of 5 cocktails. What's the last gloriously gritty book you read? Let me know in the comments. Read this review, and stalk my reading habits, here.